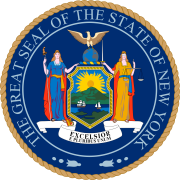 The 1937 New York state election was held on November 2, 1937, to elect a judge of the New York Court of Appeals, as well as all members of the New York State Assembly. Besides, delegates for the New York State Constitutional Convention, to be held in 1938, were elected, and an amendment to the State Constitution which proposed the increase of the term in office of the members of the New York State Assembly to two years, and of the statewide elected state officers (Governor, Lieutenant Governor, Comptroller, Attorney General) to four years, was accepted. In 1937, there was only one state officer to be elected statewide for a standing office: a judge of the Court of Appeals, to succeed Irving Lehman, whose term would expire at the end of the year. Besides, 15 delegates-at-large for the constitutional convention were elected statewide, the remaining delegates were elected in the assembly districts. The Democratic State Committee met on September 24 at Albany, New York, U.S. Postmaster General James A. Farley presided. The incumbent Irving Lehman was nominated to succeed himself. The American Labor State Committee met on September 25 and endorsed the Democratic incumbent Irving Lehman for re-election. Besides, delegates-at-large for the constitutional convention were nominated, including the endorsement of seven Democrats but no Republicans.